How can Reflexology help me beat the Winter Blues? It’s that time of year again, where the weather doesn’t know what to do, people in your office are getting sick…and you’re trying to avoid getting sick. What if there was a way to help manage your stress, boost your brain power at work through these upcoming cold months, and improve your overall well-being? Imagine there are connection zones between your hands and feet that represent certain areas of your body and can be adjusted or managed through these specific zones! By massaging and giving an appropriate amount of pressure of the feet and hands, that the corresponding organ or body part will be energized and rejuvenated. 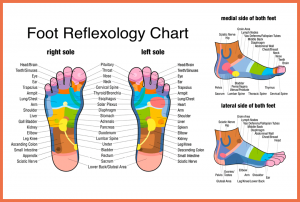 Reflexology is used to restore and maintain your body’s natural balance to help improve overall well-being, it is one of the safest and least invasive alternative therapeutic practices available today. Sit In Front of a computer for work? Reflexology opens neural pathways and allows a free-flowing activity that will result in a more relaxed state in the body and mind. What can you take-away from this article? By reducing stress now, you will decrease the likelihood of developing other illness, boost your immune system and feel awesome everyday.